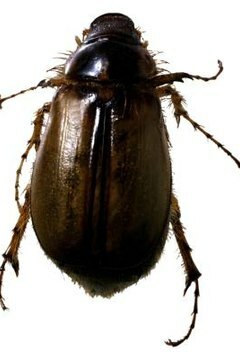 June bugs -- also referred to as June beetles -- are common insects in North America and other parts of the world. More than 100 species exist in genus Phyllophaga. Species differ in aspects such as habitat, seasonal occurrence, distribution and length. However, most adult June bugs range from a half-inch to an inch in length. The reddish-brown insects are nocturnal, which explains why they're attracted to light. Most June bugs have a life cycle of approximately three years. June bug life begins with the egg. Females hide about 2 to 5 inches deep in the soil, where they lay eggs during midsummer. They lay approximately 60 to 75 eggs over a two-week period. The eggs are elliptical initially but become spherical as the larvae develop. The larvae growth inside the eggs is sometimes referred to as the pupal stage. In about two and a half weeks, the eggs hatch into grubs, which are white in color. Upon hatching from the eggs, June bugs enter their initial larval instar. At this stage the bugs are simply brown-headed white grubs. They undergo three instars and molt twice before pupating. The larval stage is the most destructive stage of the insects. The grubs have excessively high appetites and feed constantly. Larval June bugs feed in warm summers and under the soil during winter. During their last larval instar the June bugs dig deep into the soil to shield themselves from freezing winter temperatures. It's during this period when the larvae pupate. While some species develop into pupa within one season, others feed for a number of summers before developing into pupa. This is the last stage before the June bugs mature into adulthood. The brown pupa June bugs start to change colour to metallic green while gradually assuming their adult shape. This stage lasts for three weeks before they fully mature into adults. Adult June bugs show up later in summer and spring after around three weeks in pupa stage. While they mainly feed on the leaves of oak and walnut trees, among other plants' foliage, they cause very little damage. However, they are a nuisance -- especially at night, in the presence of light. Female June bugs burrow in the soil and lay eggs to complete the cycle. Despite the fact that June bugs are nocturnal, most of them die from long exposure to light.